We are able to build auto loading & take out systems or if you prefer, a hand loaded system. We can also incorporate a light curtain for safety. In addition, we can offer a complete electrical programmer from manufacturers such as, Allen-Bradley, Omron, etc. 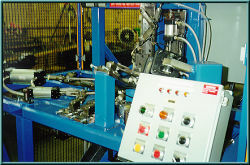 Installation of an electrical programmer is completed during the manufacturing process. All of our equipment is built to customer specifications and meet CSA & OSHA standards. All Bendtech machines are shipped ready to operate and only require air & a 110V electrical supply. 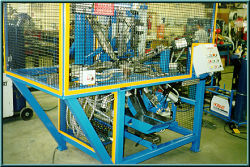 The majority of our projects are pneumatic, however we have the capability to bend hydraulic as well. The diameter of these materials varies from 3/16" to approximately 1". The majority of Bendtech's customers are based in the USA, and through them we have shipped machines to Europe, Mexico and points throughout North America. If you have any projects that we can assist with or would like more information about Bendtech, fill in and submit our contact form or send us an e-mail directly and we'll get back to you shortly, with the requested information.